Thanks for your lovely comments about my wedding money holder. 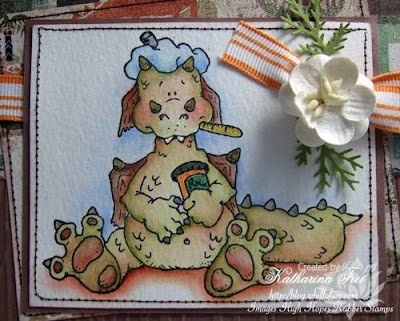 Today I want to show you a fun "Get Well" card, which I created with one of the cute High Hopes dragons. Danke für eure lieben Kommentare zu meinem Hochzeits-Geld-Halter. Heute möchte ich euch eine lustige "Baldige Besserungs" Karte zeigen, die ich mit einem der süßen High Hopes Drachen gemacht habe. Nikki provided a great sketch for this weeks High Hopes challenge. The Basic Grey "Archaic" papers fit the stamp perfectly. It is called Seymore's Sick Day, the sentiments is from Stampin' Up. I used a Cuttlebug Embossing folder to emboss the brown cardstock. Nikki hat einen tollen Sketch für die Challenge des High Hopes blogs dieser Woche entworfen. Verwendet habe ich Papiere der "Archaic" Kollektion von Basic Grey, das paßte wunderbar zu dem kranken Seymore ;) Zum embossen des braunen Cardstock habe ich einen Cuttlebug folder verwendet. Der Text ist von Stampin' Up. Thanks for stopping by. Don't forget that tomorrow is the start of the WoJ "Women's Delight" preview week. Most of the DT members already received their stamps and started crafting. Paper: SU cardstock "close to cocoa", Basic Grey "Archaic"
This is gorgeous, Katharina! Fantastic colouring, beautiful papers and embellishments. I love it! Such a sweet card and a gorgeous image! Beautifully coloured and accessorised too. Such a cute card-great colouring!Am really looking forward to the previews tomorrow! The image is just perfect for the get well theme! I love how you colored him in:-) and the colors of the DP work really nice, I especially like the embossed background paper! Your card looks stunning Katharina, love your color work! Your stuff is so great!!! You have been awarded...Please stop by my blog and pick up your award. He is adorable!! Love how you colored him in and I like your use of ribbon and button. Perfect papers for this dragon. I,m looking forward to seing the DT,s Creations. 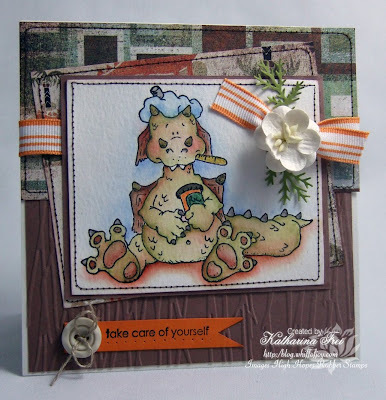 Oh I adore your card, love this swet dragon and you have coloured him beautifully too! What a wonderful card, reaaly cute! What a lovely image. This popped right out when my subscription jumped into my mailbox. Your colouring is beautiful. You are so awesome, Katharina. I just love each and every thing you create. I love the coloring you did on the dragon and the cute way you attached the sentiment. Also love the extra dimension and texture you gave it with the CB'd layer. You are brilliant!